This is a review of the two gazebo bird feeders Eco-Strong Hanging Gazebo Bird Feeder feeder from Duncraft, and PetsNall Hanging Gazebo Bird Feeder. - Attract birds searching for food. holds up to 2.25 lb of seeds. - Offering birds a comfortable place to perch, and enjoy the seed. - Invites birds into your yard, allowing you to enjoy watching birds from your window, your deck or patio. 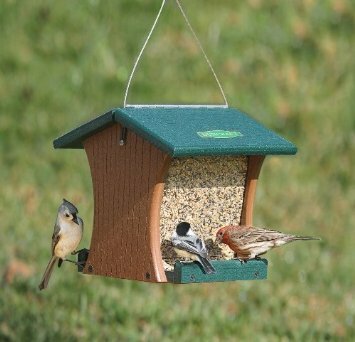 The good thing about this little feeder is that you can fill it with a variety of seed types that will give you a large variety of birds to attract. Like black oil sunflower seed, safflower seed, or mix seed to attract chickadees, cardinals, house finches, goldfinches, blue jays, starlings, warblers, and more! The feeder comes with hexagon shape, the PetsN'all Hanging Gazebo Bird Feeder is features with an angled roof that is a good coverage from the rain and snow. The wrap-around seed tray will allow space for smaller birds to perch and feed but not the larger species. As seed is eaten, more naturally flow and fills the tray. It is made of plastic so don’t drop it as it is not shock proof. This PetsN'all Hanging Gazebo Bird Feeder is designed with a twist lock cap to keep the lid closed and the seed will be kept dry. The refilling is done by turning, unlocking and lifting up the lid. This lid in my opinion is sometimes difficult to lock back in place. I don’t like the fact this feeder is made of plastic. The squirrels can destroy it if you have them, so you must place it out of reach. The hanging string is made of metal so this is good, they cannot chew on it. The thing I like is a transparent reservoir that makes it easy to check seed levels and refill. It is good to find a place where there is no branch or other way for squirrels to jump on the feeder. It is recommended to use squirrel baffle to protect the feeder, this is a good way to prevent them from getting the seed. It is an extra expense but it stops the squirrels for good. There is not much to maintain with this gazebo bird feeder, check this bird feeder when you refill for insects or mold, and you can wash it by hand with a you can mild soap and water solution. This gazebo bird feeder is easy to use and clean. The metal string is strong and makes it easy to hang. When refilling you can sometime struggle with the top to put it back in place. The plastic design is not ideal as it can brake if dropped full of seed when it is heavy. On the other hand the metal feeder will cost you double the price. This bird feeder is one of the cheapest on the market, and will not break your piggy bank. 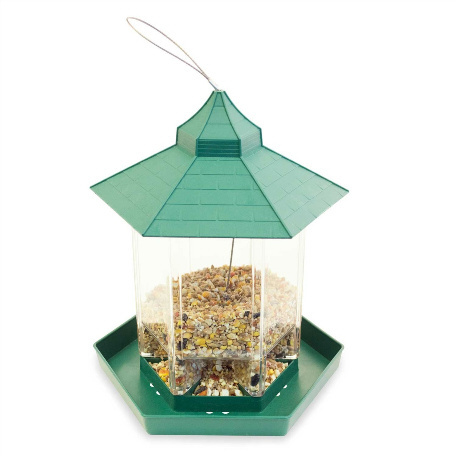 Check PetsN'all Hanging Gazebo Bird Feeder here. What first strike when I look at the feeder is very elegant design and colour, this feeder is also versatile, it can hold variety of food and serve a range of backyard birds. This Duncraft feeder is made of recycled plastic and it is made in a way to resist squirrels. It is a lovely addition to your bird feeding yard. This feeder is made of durable and sturdy material and is constructed to last in all weather conditions., its side is easy to remove and clean, this is certainly a plus. It is build with a large capacity and easy access for birds to the seed, versatility will accommodate large number of birds that come to your yard. Its sloped construction is designed to keep the seeds fresh, and roof overlaps the seeds to give protection, but not significantly, in case of rain water can still wet the seed. Lack of drainage is another issue, but its sufficient. This Eco-Strong Hanging Gazebo Bird feeder is constructed with heavy-duty plastic and wood that is sturdy, scratch, crack and discoloration proof, and made of beautiful design, a rare match. The frame is made of 5" (1.3 cm) thickness that is design to be squirrel proof. The design and color makes it stand out in the yard, and can help hungry birds to notice the hopper more easily, this is more evident in winter in contrast to white snow., and in spring. The roof design is made steep to shed rain and prevent snow build up on top, it has easy access for refilling and cleaning. The tray is also slightly sloped to ensure seed flow , some but the lack of drainage can still collect water at the base, to make sure this is not happening hang the feeder in a slightly sheltered area to minimize it. The reservoir is made of sturdy plastic, and can be removed easily for cleaning the inside of the feeder, and airflow is abundant to ensure the seed is kept dry. Feeder reservoir is designed to be used with a large variety of seeds, like sunflower seed, safflower seed, peanuts, but also it can be used for smaller seeds like Nyer. The feeder will attract birds like wrens, finches and chickadees , and larger birds like tanagers will sit in the tray and feed. Larger capacity of the feeder and two side access will support a large variety of backyard birds. Feeder is equipped with a coated wire attached to the sides so it can be hung at the desired location, but I recommend covered area to give it some added protection from rain. Check Duncraft Eco-Strong Hanging Bird Feeder here.